I have an interest in catalog cards and card catalog cabinets that is reflected in both the Library History Buff Blog and the Library History Buff website. Allen Veaner, the former Director of Libraries at the University of California at Santa Barbara, became aware of my interest in library history and contacted me to see if I would be interested in a collection of "catalogue" cards that he had salvaged from his time as a cataloguer at the Widener Library of Harvard University. I, of course, said yes. 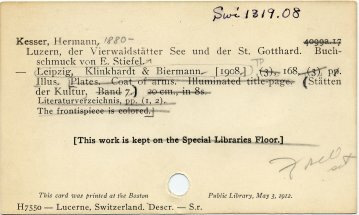 The collection was of particular interest to me because of the role that Harvard played in the early adoption of the card catalog by libraries in the United States and by its use of a 2 inch by 3 inch catalog card instead of what became the universal standard 7.5 x 12.5 cm catalog card. Allen's collection consisted of five of the 2 x 3 inch cards, 42 standard size cards, and three order cards. Below is an essay about the collection which he was kind enough to provide with the collection. I have included scans of some of the cards. Click here for a historical overview of the card catalog. Click here for examples and uses of card catalog cabinets. Click here for examples and uses of old catalog cards. For more information on early library catalogs in Boston libraries read: Mitchell, Barbara A. "Boston Library Catalogues, 1850-1875 Female Labor and Technological Change," in Augst and Carpenter, eds. Institutions of Reading: The Social Life of Libraries in the United States (University of Massachusetts Press, 2007), pp. 119-147. Modern librarians are so accustomed to online systems that most recent professionals have little or no experience with card catalogs. Here I relate a few anecdotes about file management in the card era. I hope they will illustrate the distance we have traveled. The scope of my essay is confined solely to my experience in Widener library, Harvard University. For two years, 1957-59, I was a junior cataloguer at Widener, responsible only for descriptive cataloguing; others—much more senior staff—took care of subject cataloguing and classification. In my limited capacity one of my duties was troubleshooting problem entries and resolving inconsistencies in the bibliographic record. Very often I worked with some quite old catalogue cards, some of which predated universal acceptance of Melvil Dewey’s 75 mm x 125 mm format. This brief account of my experiences accompanies actual specimens of old, original catalogue records from Widener Library’s Official Catalogue. When old records of non-standard size or format were replaced with modern, standard size records, it was customary to discard the superseded records. However, I sometimes retained these old records as historical curiosities and now (June, 2009) I am giving them to Larry Nix, well-known library history buff. Incidentally, fifty years ago Harvard maintained the traditional spelling of catalogue with the "ue" from the British spelling. I am maintaining that tradition in this account. There were two major card catalogues in Widener Library: a Public Catalogue (PC) on the library’s main floor (the second floor) and an Official Catalogue (OC) on the first floor where the Catalogue Department’s offices and work areas were located. As a union catalogue, the OC theoretically contained a main entry for every title held by the University’s library system, which at that time comprised nearly a hundred units among Harvard’s branch libraries within the Faculty of Arts & Sciences, and within the various professional schools (law, medicine, and others). Libraries outside the administrative jurisdiction of the Harvard College Library (HCL) did their own cataloging and were responsible for sending a main entry card to the OC so there could be one place to search for all holdings of all Harvard libraries. Changes made in the OC would sometimes require extensive changes to the PC. The PC held main, title, subject, and sometimes other secondary entries, for holdings under the jurisdiction of HCL, but not for the libraries of the professional schools or certain specialized academic units. Holdings of the entire University Library system were reflected only in the OC, and only by their main entries. When I replaced an antique OC record of an item also recorded in the PC, it was necessary to prepare new card sets for the PC to cover revised title, subject, series, and other entries. Very rarely, a problem required reclassification. Only the head or assistant head of the Catalogue Department made the reclassification decision. Many times it was essential to examine the work itself. Typically, a campus messenger service took care of bringing distant items to Widener Library so that I could have the book in hand to prepare a revised entry. Library of Congress. LC cards were liberally annotated or altered, and very often a “proof” LC card printed on thin, cheap paper found its way into the OC. Entries cut from vendor catalogues and pasted onto card stock. In Widener Library, and in other units administered as part of HCL, Harvard used its own classification system until the switchover to LC. Harvard’s alphanumeric classification system was heavily mnemonic, typically starting with an obvious abbreviation for a major category, e.g., Ger = German history and culture, LSoc = journals of learned societies. On the cards, all call numbers were formatted horizontally, never stacked. This was intended as a space saving device with the goal of cutting down on the growth rate of the catalogue and thus putting off the need to buy additional expensive cabinetry. The library generated series entries only on a selective basis. If no series entry was to be provided, a main entry card that bore series information was marked on the back with a tracing: srnk = series record not kept. In numerous cases, especially with handwritten cards, a call number was added in pencil and in a different hand. This suggests that earlier in the library’s history—before the Widener building was constructed—books might have been shelved by size or were arranged in fixed locations. Sometimes the only change to a record was the substitution of a printed for a handwritten card. In such instances, the legend “Substituted card” was handwritten on the new card. 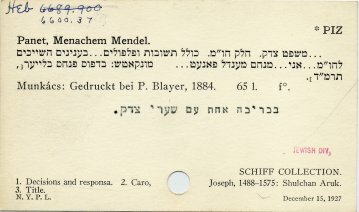 If an earlier entry was so hopelessly mixed up or new information suggested a complete reorganization of the bibliographic record was desirable or, for whatever reason, existing cards could not be salvaged, a new entry was required. In such cases I would prepare a new, handwritten entry citing other authorities and catalogues, such as BM for British Museum, BN for Bibliothèque Nationale, etc., plus arguments of my own in support of an entire reorganization of the bibliographic record. One such entry (for Gubernatis, LC 7-39363) is included with the materials I am forwarding to Larry Nix. Typically, subject cards for the PC had their subject headings typed with a red ribbon. After bi-color ribbons became too expensive or harder to obtain, subject heading were simply typed entirely in upper case. Sometimes an entry was clipped from a bookseller’s catalogue and directly imported into the OC. Other times a copy of an order slip became the Official Catalogue’s entry. Included in this collection are a few order slips, each about 2.75” x 6.75”. One bears a “received” date of February 8, 1882 and the other July 6, 1908. The latter’s bibliographic information was taken directly from a vendor’s printed catalogue and pasted onto the order slip. Thus, informal records migrated into the OC. Probably the intention was to generate permanent, formal bibliographic records later, but this was never done. To avoid fatigue and consequent errors, and as an aid to learning the catalogue, all new professional employees and selected support staff were assigned to file cards into the OC. Filing duty was limited to a few hours a day and would run for several months. New filers were required to file “on the rod” so that supervisor could first check the accuracy of filing before the rod was withdrawn and the cards lowered into place. The entire process was a great learning experience. It taught me to know and appreciate that the card catalogues of great university libraries were indeed powerful research instruments. I suspect that those that remain still are.